Don’t miss the new Etoys book: http://wiki.squeakland.org/index.php/LearningWithEtoysI3. All school children should have the opportunity to engage with computers in the most meaningful way. Learning to think and using the computer to discover and work with powerful ideas is the knowledge of true value. The community of Etoys users is working toward the dream of having all students become computer literate. This book only covers a small portion of those items. As you and your students learn some of the basic techniques, you will find more and more uses for them. The process of learning Etoys is just that, a process; the learning is on-going even though projects are begun and finished. Students will enjoy becoming experts and sharing their knowledge with others in the classroom. 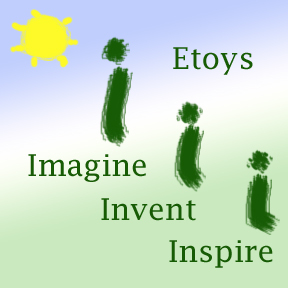 Imagine this: A group of learners want to visualize what they Imagine so they go to Etoys to Invent their dreams and Inspire each other by building on their various Etoys projects. Today’s learners need this kind of experience to be prepared for the future. 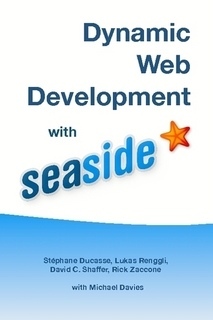 A print-on-demand, softcover copy of the book “Dynamic Web Development with Seaside” is now available from Lulu. Seaside is an source framework for developing highly dynamic and interactive web applications, and makes building web applications as simple as building desktop applications. The book gives you all the instruction and support necessary to get up and running in all the popular distributions of Smalltalk, with separate chapters on Pharo and Squeak, Cincom Smalltalk, Gemstone/S, GNU Smalltalk and VASmalltalk. The printed book is based on the free online version and the purchasable PDF version of the book, and will be updated regularly. The book costs around €28/£24/$40 and will be delivered within 3-5 working days, so order your copy now! The authors wish to thank the European Smalltalk User Group (ESUG), inceptive.be, Cincom Smalltalk, Gemstone Smalltalk, and Instantiations for generously sponsoring this book. “Squeak: Learn Programming with Robots” now free! Stéphane Ducasse writes that his book “Squeak: Learn Programming with Robots” is now free. The book was the result of a collaboration by Stéph with his wife who was a maths and physics teacher in a French school for students aged 11–15, meaning that the book addresses many of the issues that are raised by children when first introduced to programming concepts. It uses a simple environment written in Squeak Smalltalk to allow children to create and manipulate bots. Thanks to financial support from ESUG, Stéph has now been able to buy back the rights to the book in order to release it for free. He is now working to make the book available on his website, and translations are already under way. The original book is still available for purchase both as hard copy and for download onto Amazon’s Kindle. Squeak by Example has been a hugely successful introduction to Squeak since its publication last year, and it has now been made available to a wider audience, following the publication of a French edition Squeak par l’exemple. As with the English edition, the book has been made available in print from print-on-demand specialists lulu.com for around €17/$20/£11, or can be downloaded from the site as a pdf. Squeak par l’exemple was produced thanks to the hard work of the team of translators: Martial Boniou, Mathieu Chappuis, Luc Fabresse, René Mages, Nicolas Petton, Alain Plantec, Benoît Tuduri and Serge Stinckwich. The book is based on the online tutorial developed at the Hasso-Plattner Institut, and the content has been revised and expanded for this edition. The 212-page book can be previewed and ordered at online publisher lulu.com for about €20/£14/$25. Congratulations to all involved at the HPI Software Architecture Group for producing this great introduction to Seaside. They are: David Tibbe, Michael Perscheid, Martin Beck, Stefan Berger, Jeff Eastman, Michael Haupt, Robert Hirschfeld and Peter Osburg. Stéphane Ducasse has just announced that the second edition of Squeak By Example has just been published. It is available for download from the Squeak By Example website, or if you prefer paper to phosphors, you can order a hard copy from print-on-demand publishers lulu.com for only €16.18/$20.10/£11.07. Licensed under the creative commons by-sa licence, the first edition was a great success, with over 20,000 downloads in less than six months. For the second edition, the authors Oscar Nierstrasz, Stéphane Ducasse, Damien Pollet and Andrew P. Black, have reviewed and revised the contents based on feedback from readers. At over 300 pages, the book is an excellent introduction to developing in Squeak, and the overall organization and choice of topics makes it a great reference work.